What Is A Japanese Bidet? 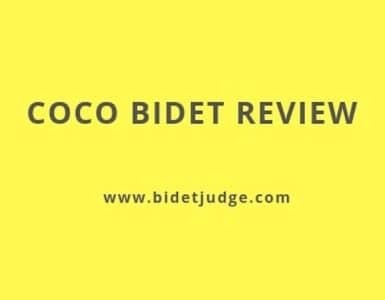 What Are The Biggest Japanese Bidet Toilet Brands? A Japanese bidet is just a fancy name for what is known in the US as a washlet or a toilet seat bidet. It simply refers to the Japanese origin of these appliances and how they came to be. These are mostly electronic in nature and feature either a sidearm panel or a remote control to allow you to control all the features. Japanese Bidets have nozzles that can help you clean yourself from the front and rear both. They even allow you to control the pressure and the temperature of the water. Moreover, it offers premium features such as a deodorizer, music, warm air dryer, as well as heated seats. These have recently gained traction in the West with more and more people converting from Toilet paper to Japanese bidets. These toilets are high-class quality and will last longer than any other toilet bidet. Like the brand ‘Hoover’ that is often used when describing a vacuum cleaner, the ‘Washlet’ has become synonymous to toilet bidet seats due to their popularity. Toto was founded in about 1962 and started off as a metal fittings company. The company cares about its customers and the environment as well. All Toto washlets are of high quality. They are the most popular brand when it comes to any bidet, not just Japanese bidets. INAX was founded in Japan in, as early as, 1929. It started off as a ceramic tile and sanitary ware manufacturer. Today INAX is one of the leading manufacturers in Japanese style bidets. The INAX bidets are all fully functional with most being anti-bacterial as well. Panasonic is yet another Japanese brand that has been out for a long time. They dabble in a wide variety of trades ranging from TV to Air conditioners. However, their most remarkable product has to be their toilet bidets. These bidets are made to perfection and ensure you don’t waste toilet paper. Toto is a name that has become synonymous with toilet seat bidets in the US. Their huge popularity is a result of their durable and reliable results that have tested well over time. The C100 simply confirms this as it is one of the most affordable and the best Japanese bidet. The Japanese washlet features a rear wash and a front wash that allows you to cleanse yourself with warm water. The water temperature and the pressure can be adjusted according to five different settings. So, you never have to compromise on your preferences. Also included is a premist function which functions by using the water from the water supply and misting the toilet after every use. This keeps a more hygienic environment and helps any solid waste from building up. The heated seat is a revered feature in colder countries. It is available in five different heat settings to allow maximum comfort. The Air in Wonder Wave Technology mixes air bubbles with the water stream to allow for a more gentle yet effective wash. On the other hand, features such as the Deodorizer and the dryer help create a premium luxury environment for the user. Not to mention that the temperature of the dryer is adjustable as well. You don’t even have to clean the wand! In fact, the wand uses a self-cleaning technology that can be cleaned after each use. The device is remotely controlled so you can have full control in the palm of your hand. Adjustable heat and pressure settings. Rear and front wash are both available. Easier to clean the bowl and the wand. Takes a lot of time to dry properly. Hot water is not continuous and can end. 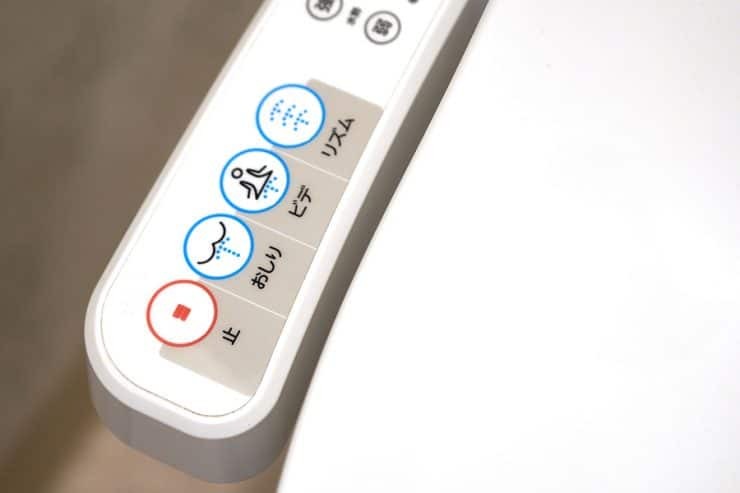 It should come as no surprise that another toilet seat from Toto has landed itself on our best Japanese bidets list. The Toto A100 is the perfect personification of comfort and hygiene. The seat comes in an elongated shape that allows heavier and bigger individuals to sit on it without any worries. The seat is heated as well and you can easily set the temperature of the seat according to your preferences. This feature is what makes it so popular in the northern US where going to the toilet can be hard due to the extreme cold. The control panel is featured on the side where every button has its own function. Unlike remote controls, you can never lose them! Even users with limited mobility can use these panels with ease. The Toto A100 features the same Air in Wonder Wave technology as the C200. It allows air to be injected inside the water stream to deliver a gentler and cleansing stream. Let’s not forget that the water pressure and temperature can be easily controlled using the side panels. Another great add-on is the quick release feature. 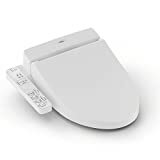 This feature allows you to install and detach the toilet seat from the bowl without any hassles. This is why the Toto A100 is so much easier to install. What’s more is the soft close lid that allows you to close the lid without ever slamming or touching it with your hands. All in all, the Toto A100 is the perfect option for those looking for hygienic luxury without investing too much. Allows a gentle stream of water to cleanse you. Side control panel which is always in reach. Adjustable temperature and pressure controls. Suitable for all kinds of folks. Has a little bit of a learning curve. 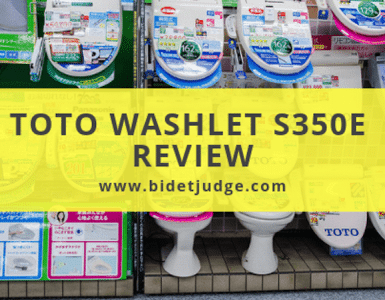 TOTO also offer more luxury bidets, such as TOTO Washlet s350e. 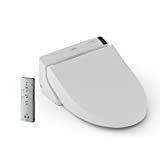 The Inax 415 is a one of a kind toilet bidet seat as it features an advanced personal cleaning system that helps deliver to you the utmost comfort and cleanliness. The seat is adjustable and heated as well. The heat and the position of the seat can be adjusted using the 3 preset settings. However, it also allows you to save about 2 customized settings. Moreover, it comprises of an adjustable water controls. You can easily set the temperature and pressure of the water stream according to 5 different settings. This allows you to set your own spray strength. Plus, there is a massage setting as well to help you gain a spa-like experience. The deodorizer allows you to filter the odors and keep the bathroom smelling fresh. The toilet seat uses a charcoal filter to do so. The function is activated as soon as you sit down and gets deactivated as soon as you stand up. The anti-bacterial protection on the seat, nozzles and the cover, as well as the control panel, effectively inhibits the growth of pathogens and any other microorganisms. The soft closing seat means you never have to slam the toilet seat down again. It allows for a slow, quiet and hands-free closing. The nozzle features a self-cleaning technology whereby the nozzle is automatically rinsed after each use. The bidet also allows for a feminine front wash and rear wash. The quick detach seat cover only needs a button to be pressed before it can be detached. This means you can easily detach the seat to clean the bowl whenever you want. Easy to detach and clean. Features customizable pressure and temperature settings. Removes all odors from around the seat. Might not fit all kinds of plumbing connections. Cleaning the charcoal filters is quite hard. The Inax 8013 is yet another model that exudes elegance and comfort. The seat is perfect for users who want to set it at their exact comfort level. The seat allows users to either choose from three preset temperature and pressure settings or customize and use two of their own. It does so with the heated set as well where you can easily control the temperature of the seat. The heated seat is a remarkable feature for those who live in the colder parts of the country. It allows them to go to the toilet without making the experience uncomfortable. Along with the water controls, a massage feature is also present that is perfect for this suffering from hemorrhoids or other ailments. The deodorizer is equipped with charcoal filter cartridge which helps filter out nasty odors from the room. Let’s not forget that the filter is quite easy to access and easy to clean. Unlike the 8012 you won’t face any problems trying to clean it this filter. Also included are two different nozzles, one for a more a gentler feminine wash while the other harsher one is more suited for posterior wash. These nozzles work independently and even have a self-cleaning feature. This means there will be no solid buildup or calcium deposits on the nose. Thus, the Inax is quite easy to clean as it does half the job itself. The antibacterial seat covering is yet another plus point which ensures that your seat always remains free of any pathogens. Antibacterial seat for a truly hygienic environment. Deodorizer filter is easy to clean and access. Customized pressure and temperature settings are available. Feminine and posterior wash are available. Does not have bumpers in the bottom for support. Panasonic is one of the best Japanese bidets when it comes to quality and affordability in the same package. While they may not be terribly affordable, they still lie in the midranges. The toilet seat bidet is quite lightweight weighing about 3.5 kg. Furthermore, it will help you save up on energy consumption as it merely uses 332W. 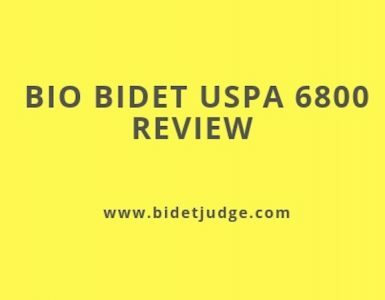 The bidet features a dual nozzle where one of the nozzles is used for a gentler wash for anterior cleaning while the other nozzle produces a more pressurized spray which is perfect for posterior cleaning. The feminine spray is also an oscillating spray to provide better cleaning for. What’s more is that the nozzle is a self-cleaning one as in it washes after each use. The wash is an anti-bacterial wash to keep the nozzle free from harmful pathogens. Plus, the nozzle is stain-resistance which means it will stay stain free for a longer time. This makes it easier for you to maintain the bidet and keep it neat and clean. In fact, the seat has an antibacterial coating that includes silver ions to prevent the buildup of bacteria. The water temperature can be heated as well to a temperature that you prefer. This means more luxurious comfort for you in the toilet. The spray patterns can be set according to your preferences as well. These can be rhythmic pray, oscillating spray, pulsating spray, and a warm water spray. These allow you a spa-like experience at the comfort of your own home. Front and rear washes available. The antibacterial coating on the seat and the nozzle. Temperature and pressures are adjustable. No deodorizer or dryer present. Spray pressures might be too low for some folks. 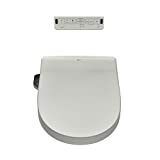 Another amazing toilet seat bidet from the Japanese company, Panasonic, the EDX10 is jam-packed full of features tailored to your needs. These features can help you achieve the perfect balance of comfort and luxury at a moderate price. The seamless design of the toilet seat makes it easier for you to clean the toilet seat as there are no crevices in which dust or dirt can gather. It keeps all moisture out so the toilet seat bidet remains clean. What’ the best part? Well, the toilet seat bidet can be used with all kinds of toilets so you don’t have to go through the hassle of choosing one. What’s more is that the seat comes with a deodorizer as well that filters out all kinds of odors to keep the toilet fresh. Furthermore, it includes a warm air dryer that helps you keep clean. The dryer is easy to attach and detach as well. The toilet seat is heated as well which is a savior feature for those living in the colder areas. Cold mornings will never be the same with the Panasonic’s adjustable temperature heated seat. The seat is equipped with various spray patterns such as the Oscillating spray, wide spray, and the rhythmic spray. All of these features will help you ensure a thorough cleaning. It also has dual nozzles each for a different kind of a wash. Both the nozzles are easier to clean as well as they come with a self-cleaning feature. Seamless design makes it easier to clean. Warm air dryer for utmost comfort. Variety of spray patterns available. Adjustable temperature and pressure settings. Needs a voltage converter to convert to American standards. The air dryer is too slow. Any of the best Japanese bidets are bound to leave you with a fresh, clean and hygienic experience. They all come equipped with the latest features such as a deodorizer and a warm air dryer to ensure you get only the best luxury experience. All these bidets are bound to make you feel like you’re in Japan since it is the pioneer of toilet luxury. You can count on any of these to help you keep yourself clean!